As recognized by the United States Board on Geographic names, the name of the body of water that lies between Iran and the Arab states of the Gulf Cooperation Council is the Persian Gulf. For political reasons, Arabs often refer to it as the Arab or Arabian Gulf (The Persian Gulf at the Millennium: Essays in Politics, Economy, Security, and Religion edited by Gary G. Sick, Lawrence G. Potter, pg 8). (Note .pdf files in this article are relatively large due to their high quality and it is recommended that they are downloaded complete before they are opened). Recently a new site by the name: www.arabiangulfmaps.com (Site A) has popped up which claims that some 16th century maps have referred to the body of the water as Arabian Gulf. In this article we will show their claim is invalid based on many reasons and such a naming lacks historical legitimacy. provides a complete listing. We will provide some scanned photos of the source which unlike site A lists the exact source of the map. Note from the era of the Greek classics the name Persian Gulf has been consistently used for the body of water known today as Persian Gulf. Also it is well known fact that the Arabian Gulf refers to the red sea in many classic western texts. A list which contains about 400 authors who have used the term Persian Gulf since the time of the ancient Greeks is given below., Please continue with the text after examining this list. Dunn, Samuel (fl. 1751-1794 A.D.)....................................... .............................452. Let us analyze Site A in more detail. The first analysis shows that site A does not hold true to its word with regards to providing maps that have the designation :’’Arabian Gulf’’. If any user clicks under collections in this site and then view a map and then click on map index and then clicks on the one from 1740(Jacques Nicholas Bellin) and does a zoom on the map, it is very clear that on the legend on the bottom left corner of the image it clearly says on the text ''Et Golfe de Perse'' (Persian Gulf). Thus this map is out. Apprxoimately 60% of the maps in the site are from Meractor-Hondius-Jannsonis and approximately 20% are from John Speed. 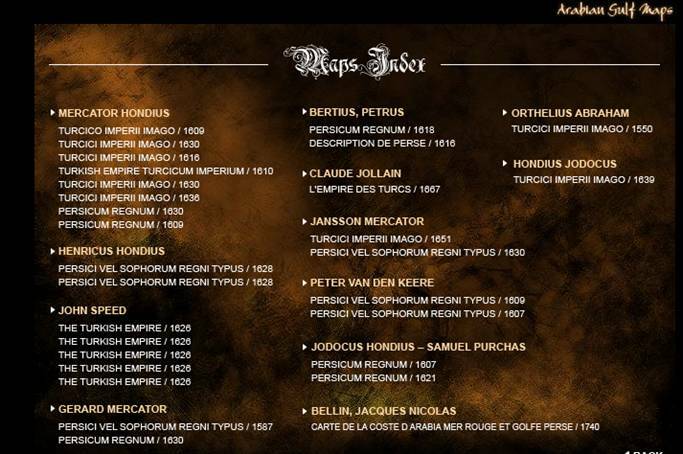 Regarding the English map of Meractor-Hondius-Jannsonius (they have it in variety of languages and only the English one seems to have a problem) which has Sinus Arabicus, let us quote another reliable academic source and also include the more recent maps. (Dr. Cyrus Alai, General Maps of Persia 1477 - 1925 (Handbook of Oriental Studies: Section 1, the Near and Middle East) (Hardcover)), Brill Academic Publishers, 2005. Please note that the information is taken from a highly regarded academic book extremely referenced book with over 400+ maps of Persia. From the above we can assume that the historically legitimate name of Persian Gulf has always been in use whereas the non-legitimate term of Arabian Gulf has no precedence. As mentioned in the texts of the Atlases, the nomenclature Arabian Gulf never existed as a historical name. Much more importantly there does not exist a single textual evidence referring to the Persian Gulf as Arabian Gulf. Now in the texts of the above Atlases mentioned in Site A, only Persian Gulf is referred to and there does not exist a single line where Arabian Gulf is mentioned for the Persian Gulf. Also in the same atlases there are more maps of Persian Gulf. There does not exist a single Arabic text before the era of pan-arabism nationalism of 20th century that calls the body of water Arabian Gulf. The Site has watermarked its images and thus its reliability can not be ascertained. Site A also hides the fact that Mercator and Hondius have more maps with the designation of Persian and most importantly in the text of their Atlas they only use Persian Gulf. The story is similar with John Speed who probably used one of older version of Hondius. In the text as well as many of the maps in the same book (which site A took their map from) the Persian Gulf is mentioned whereas no where in the text of the Atlases is the term Arabian Gulf mentioned. Thus site A has suspiciously hid this fact from readers of their site in order to make a legitimate claim for a historically illegitimate name. Note so far that site A has not brought a single textual evidence. It is from the first edition of Hexam's translation brought out by Jodocus's son Henry Hondius. The year of publishing is believed to be 1641 (or 1644?) from the legend. Note the map on pg 10 of the PDF clearly says Persian Gulf (Sinus Persicus). The map on pg 12 is ambiguous as it is has used the term Sinus Arabicus twice which shows a clear mistake. And finally the map on pg 20 uses Sinus Arabicus. All these maps are from the same book. But the owner of Site A does not display the map on pg 10. Similarly he makes no mention of the texts within the Atlas which have clearly used Persian Gulf throughout. Now let us quote the text (pg 19 on the PDF): ‘’This Kingdom is situate between the Turkish empire; the Tatar Zagatheans the Kingdom Cambaya, between the Hircanian or Caspian Sea, and the PERSIAN GULF;…’’ . Similarly the text continues: ‘’On the South is Persian Gulf and the India Sea’’. Thus to pick and choose one map from the same book and ignore the texts and other maps from the same book does not create any sort of historical legitimacy for a name. Site A intentionally fails to bring the relevant maps from the same book and tries to make the readers believe that the name of this body of water was Sinus Arabicus. But as the text clearly shows, Meractor considers it as Persian Gulf and in the same book he has a map with Sinus Persicus. In the end as will be seen, the map probably considers both Persian Gulf and Red Sea as part of the Arabian Sea. Note Mare Rubrum (red sea) is mentioned below the horn of Africa! Thus this clearly shows that without textual evidence, one can not look at a map blindly. Note Mare Rubrum (red Sea) is again below the horn of Africa. Note that there is Mare el-Catif where the Persian Gulf is. Note the Red Sea is called:’’ARABICI SINUS PARS Mare Rubrum’’. Now let us try another version of Hondius. note misplacement of red sea (Mare Rubrum) all the way below the horn of Afica). Again showing without textual evidence, such maps can not be interpreted. (note misplacement of red sea (Mare Rubrum) all the way below the horn of Afica). Again showing without textual evidence, such maps can not be interpreted. Note the Arabicus below Saudia Arabia. Note there is designation of Mare el-Qatif in the Persian Gulf. Note Sinus Arabicus is in the Red Sea. Note the difference with pg 4 and 6 where red sea is below the horn of Africa. Note despite the mark of Sinus Arabicus on the map (see comments of C-pg 15) in the map, the text clearly calls it Persian Bay. Now we examine John Speed. Note the map. Persian Gulf is called Sinus Persica. Note that the red sea is called part of the Arabian Sea. (this could be the source of some confusion). Note the misplacement. Assyria is put in the place of Persia. Thus such misplacement can easily occur in maps and this again shows maps can have mistake. So again one has to rely on the textual evidence. Note the Persian Gulf though is called Sinus Persicus here and furthermore the red sea is called part of the Arabian Sea. ‘’ Susiana, now Cuceston, seems to have her name from Cus, upon the South of Assyria, West of Persia, East of Babylonia, and North of the Persick bay. This is the map used by the Arabian Gulf site. But note from the same book two other maps on pg 9 and 12, clearly calls it Persian Gulf. I have checked all the text and the textual evidence only calls it Persick bay, Persian Gulf, Sinus Persian. Thus there is no textual evidence whatsoever for Arabian Gulf or Mare-al-Qateef. Finally besides the 400+ maps about the Persian Gulf mentioned in the first book by Dr. Sahabi, we provide maps of Persian Gulf for the rest of the authors mentioned in site A in the following two links. Note pg 21-26 of the PDF file provides multiple maps from Ottelius Abahram. Note unlike site A whose source is 1550 the exact map of the Turkish empire from the scans of Sahab’s book is from 1571. Note pg 27 provides another map from John Speed again dated 1646 which is a later date then the maps provided by site A. Thus showing another correction. Note pg 28-29 provides a map of Jodocus Hondius. Note pg 31 provides maps from Pieter van den Keere. Unlike Site A the source is dated 1676 which is much newer. Note pg 36 provides a map from Jacques Nicolas Bellin dated 1764 again much more recent then the date provided by site A. But as we mentioned already the 1740 map of Bellin in the site already mentions Persian. A) There does not exist a single textual evidence providing any sort of historical legitimacy for the name Arabian Gulf in reference to the body of water known universally as Persian Gulf in any text. B) A few maps by Hondius made a cartographic mistake. For example it was pointed out that Assyria was put in Central Persia or the red sea was placed in various locations from Indian Ocean to below the horn of Africa to the red Sea. Later editions were corrected and thus such a cartographic mistake does not constitute any proof for any sort of historical precedence with regards to the non-historical name of Arabian Gulf. Specially in light of the textual evidence that comes with these atlases. Additionally the newer editions of the same atlases (Hondius)) have fixed their mistake and thus showing clearly that there is no precedence for the historically non-legitimate name of Arabian Gulf. So one or two map makes made a cartographic mistakes which propagated to several maps. But in these exact books there are maps with Persian Gulf and all the texts of these exact books clearly mention the body of water as Persian Gulf. One can not ignore the newer editions of atlases by the same author as well as 400+ other authors we already mentioned and also the texts within an atlas.